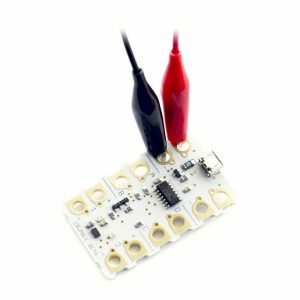 The Crumble is a cheap, easy-to-use electronics controller. A few ‘croc’ leads and a USB cable are all you need to connect motors, LEDs and sensors and begin experimenting. No programming experience is required as the FREE software is a graphical, drag-and-drop system inspired by MIT Scratch. The Crumble software runs on PC, Mac and, in the near future, Linux (including the Raspberry Pi). Inspired by MIT Scratch, programs are simply built by snapping blocks together on screen. Sending a program to the Crumble is almost instant, allowing rapid experimentation. The Crumble can be extended with digitally controlled full-colour LED, called Sparkles. Additionally, several expansions board (Crumbs) are also in the works.